Read and find out. I can tell that it is scary. It all happened in our little home in Georgia. I was mid-day when our dad came rushing to the door with the knife in his hand, scaring us to death, but before I tell you about what he did, we have to back up a few days. I remembered coming home from school on Tuesday and seeing mom and dad talking at our dinner table, when they saw me my mom suddenly become interested at the flower on the table, as if she did not want me to hear their conversation. “Hi mom, hi dad” I said, as soon as I said that my father’s eyes started glowing. He said “So, you’ve decided to finally come back” I had no idea what he was talking about but his voice sounded rough and rusty and it was like there were five of him all speaking at the same time. I got so scared I nearly fainted. “Whoa, dad what’s wrong?” I said, though my voice cracked a little, but in this situation I didn’t care one bit. My mom got up and poured water on his head. “How long was I out?” He asked, as if this was a perfectly normal thing. “Not long” My mom said. She looked at me then gestured for me to come to her. To be honest, I was very, very afraid, but I still went to her. “You’re father has been having some trouble with his latest experiments, and unfortunately this one involves ghost” She said. I looked at her as if she just pulled the pin out of a grenade, that’s how terrified I was. “But dad’s a scientist, not some ghost person expert” I said as I’m keeping my eyes on dad to make sure he doesn’t try anything. “Honey, you know how he always likes to try something new, go to your room and don’t worry, his eyes glowing wont be happening often anymore” She said. Then I quickly ran upstairs to my room. As I was getting in my room, my little sister, Jamie, came rushing to hug me. “John! You’re back” She said, with a smile on her face. “Yea” I said. “When I came home from school, daddy was scary, he made his eyes yellow and he talks with five other daddies inside of him, I’m scared John” She said, nearly tearing up. My little sister may seem sweet and nice, but she never ever cries, and I don’t think I want to see her cry. “Don’t worry Jamie, it was just a little Halloween prank dad pulled” I said that so I would not worry her but I knew what I said was very far from the truth. I walked in my room and started doing my homework to get my mind off of dad. My homework was too hard so I decided to just watch T.V. A few minutes later I heard a knocking on the door and my mom crying downstairs. I slowly opened the door and I saw a Baseball bat in my dad’s hand, and in the same nasty voice and his eyes glowing, he said to me “You’re mother, then your sister, and then you” then he shut the door with such a loud thud that my ears started to hurt. I was very, very scared, this was completely crazy, we are living with an insane scientist in the house. We had to get out, I don’t care if we were going to end up poor on the streets, we had to leave this place no matter what. I wanted to believe that this was all some kind of experiment, but I know that its not. I had to get my mom and little sister out of here. I quickly packed all my clothes and slowly went downstairs; making sure my so-called dad won’t hear me. I grabbed a fork, because it was the only sharp thing I could find and I went to go get my mom, but I did not see her, I went to see if she was in the garage maybe trying to drive away but instead I smelled blood, I got in the garage and saw my mother inside the car, her skull cracked open and her right arm twisted at an unusual angle, her bottom lip was missing and almost all her teeth was missing. I could not look at her any longer, the sight of her made me want cry, more than I have ever cried before. A few months has passed since all this happened, then one day, Jamie and I were watching T.V downstairs and dad came rushing to the door with a knife in his hand. “You’re time is up” He said. But this time there was nothing wrong with him, his eyes were not glowing and his voice was completely normal. He came to my little sister and took her by the neck. 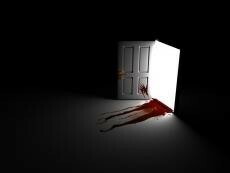 “Daddy” She said, “Please don’t hurt me” As dad raised the knife to stab her, something stabbed him instead. It was the machete that he tried to kill me with, he must have left it in the garage because the person who stabbed him was a ghostly see-through version of…mom. “Mom?” I stuttered, “You’ve gone too far Harold, you took the life of your wife and you were about to take the life of your children, I won’t allow it!” She said, then she twists the machete and he yells agony. “Guys, she said, I can’t stay long, I was only allowed to come back to kill him, I’m sorry that you guys will have to grow up with no parents, but your uncle will come pick you up tomorrow. Good luck, and just because I’m dead doesn’t mean you can misbehave” She pulled the machete away and dropped it with a disgusted look on her face. “Bye, kids” She said, and just like that she disappeared. We were now in a house, with a dead mom in the garage, a dead dad in the living room, how were we going to explain this to the police. The police came the next day and strangely they did not ask us any questions, Jamie was still crying from all of what she saw, and we knew that we will never forget this moment. © Copyright 2019 Nerd103. All rights reserved. It was not a true story, I just wrote down what came out of my head. Lol, no its not a true story. Hope you liked it. Ah, I love it when it sounds like it's a true story. Because to me, reading this, you've written it as though you come from experience. Loved it!